An infamous crocodile that survived in Hong Kong's muddy waterways, evading capture for seven months, has finally been caught. The 1.5m (5ft)-long reptile won notoriety by outfoxing a succession of hunters from Australia and China. But the tide finally turned for the scourge of Hong Kong's ditches when it strayed into one of several traps. Crocodiles are not native to Hong Kong; this specimen is believed to have begun life in a home or on a farm. The animal has become a celebrity in the Chinese territory, known more as a concrete jungle than a haven for wildlife. It has been variously nicknamed Croc Croc Chan after the family that first spotted it last year, and Gucci, because of the local popularity of the designer's crocodile skin handbags. "Yes, we've got it," a spokesman for the Agriculture and Fisheries Department confirmed on Thursday. 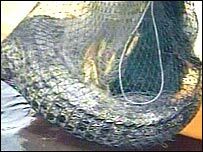 Cheung Chi-sun, a wildlife protection officer from the department, said fishermen found the saltwater croc trapped in a steel noose and secured it in their nets. 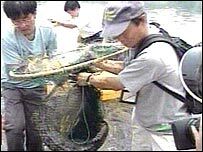 Live TV pictures showed the reptile writhing as it was carried from a dinghy and slung in the back of a truck. Local radio said the animal had been taken to a quarantine centre, from where it would probably be taken to the Kadoorie Farm nature reserve. The crocodile was first sighted in the polluted waterways of Hong Kong's New Territories last November. Local media swiftly latched on to the phenomenon. The animal's profile rose as it defied the best efforts of a succession of hunters. Australians derided the beast a "just a tiddler", and sent their best man - experienced crocodile hunter John Lever - to snap it up. But the reptile outmanoeuvred his nightly attempts to capture it. Then several hunters from mainland China came, but left embarrassed and empty-handed. Tourists flocked to take its picture and locals lived in dread of falling prey to its jaws as it prowled the water's edge, living on dead fish in the dirty creeks. Radio listeners even voted it "personality of the year". Experts say the creature could grow to a length of eight metres (26 ft). The species to which it belongs has a record of attacks on humans. It is thought the reptile may have been a pet set free when it grew too big - or an escapee from a crocodile farm in neighbouring China. He should be kept in a safe enclosed area, with other crocodiles like him. A huge crocodile sandwich and make it snappy! I think the crocodile should be slaughtered and the meat sold in an auction to the top restaurant. Crocodile meat is absolutely delicious!! The money should then be used to help the poor and needy in the city. Set it free again, it was good for tourism! A nice pair of shoes, and a crocodile skin belt will do nicely! The crocodile should either be released back into the wild, in a place where crocodiles are native, or, perhaps a really good wildlife park that specialises in crocodiles - such as Australia Zoo run by Steve Irwin. Let it retire in the swimming pool in Government House. I think the croc should be set free in the Big Brother house and the housemates given the task of capturing the animal. Would make interesting viewing. I believe that Croc Croc Chan should be sent to a zoo that is capable of looking after him, or set free in a part of the world that would suit him. He is now a celebrity after all and killing him would be tragic. The crocodile should be transferred to a well-kept zoo where its widely known recent adventure would become a tourist attraction in itself. Nothing....until it has cast its postal vote. Such an intelligent croc shouldn't be killed. The authorities should send it to an Australian croc farm. It will probably end up being used for Chinese herbal remedies!!! The Croc should be made into some of those cheap, fake handbags you see in the street-markets in Kowloon! Keep and culture it. Find a mate for it so that they multiply. Make a nice handbag and matching shoes - perfect for materialistic Hong Kong socialites. The crocodile should be released in its natural habitat. A nice pair of ridiculous shoes, with matching handbag and belt would be lovely! Put it back into captivity or some sort of reserve where it and citizens will be safe from harm. I believe the usual procedure in Hong Kong is to award it a passport and amnesty, and then revoke them 3 weeks from now, once the deportation papers are ready. Let him/her go free in the wild where it belongs. The crocodile should be given a home at Hong Kong's Ocean Park, which has the space and expertise to look after it, and where it would help to attract more visitors. I think the crocodile should be sent to a zoo in China, where it can retire gracefully from public life. Put it back in the Hong Kong Canals. As a celebrity with more charisma than most, a move into films is inevitable. Can we get Paul Hogan to dust off his hat to co-star in "Crocodile Dundee III : Escape to London"? "The reptile's appetite got the better of him"